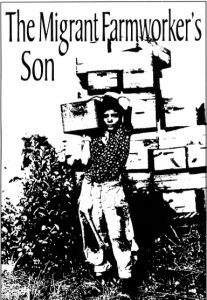 The Migrant Farmworker's Son - Silvia Gonzalez S.
Tragic-comedy 1F, 3M, a young girl and extras Unit set Full lengthThe horror of losing a child throws a family into silent turmoil with all the pressures of American assimilation.1984. Henry, a well-adjusted Mexican-American teen, lives in a small Arizona town with his parents. His mother encourages Henry to assimilate, but his dad has a harder time learning the language and customs. Since the death of the young daughter, he feels haunted, isolated, and cut off from the rest of his family. Henry’s abysmal command of Spanish fuels these feelings and his father is often abusive. 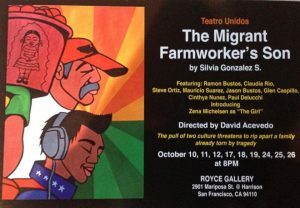 Through the play, Blue Mexican peasants appear representing migrant life and the demand of a dual culture existence. Oliverio, a warm and funny old farmworker, embeds messages in his poetry to help Henry understand something of his father’s feelings of pain and guilt. Whitfield Cook Award 1997, Workshop at Chicago Dramatists, staged reading at the University of Texas, Borderlands Theatre, and the Bilingual Foundation on the Arts.